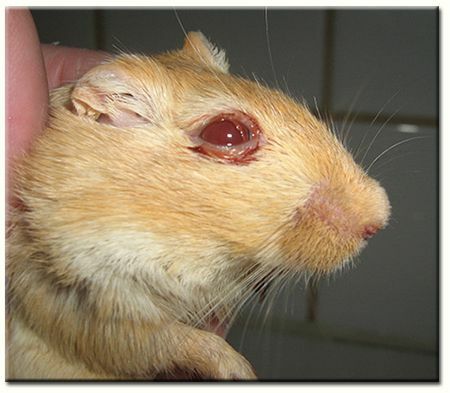 Many people ask why the gerbil occasionally has red tears around the eyes, and are often alarmed when they see these thinking there is blood in the tears. This isn't the case, and the red colouring is due to an organic compound known as porphyrin. Porphyrin is secreted by a horseshoe shaped gland called the Harderian gland, which is located behind the gerbils eyeball in the orbit. Porphyrins belong to a large important group of organic compounds, and can be found in the living cells of many plants and animals. They also have the ability to perform a wide variety of functions. Porphyrin molecules have the unique ability to be able to bind themselves to metals. The nitrogen atoms present in porphyrin act similar to teeth and hold onto metal ions. Depending on which metal they attach themselves to, they are then given different names. With haemoglobin, the red blood cell molecule has 4 heame groups (ferroporpyhrins) that bind with oxygen. These groups travel around the body and the iron in the porphyrin complex then release the oxygen into tissues to nourish it. The central metal is iron (Fe or ferrum, which is its latin name) the porphyrin complex is named ferroporpyhrin. Consists of a porphyrin molecule that has a cobalt ion in its centre. Is the molecule present in plants, which enable them to use the suns rays for energy. It is responsible for the plants green colouring and is largely made up of a porphyrin molecule whose metal iron is magnesium. Johann Jakob Harder, a Swiss physician, first described the Harderian gland in two species of deer in 1694. He realised that he had discovered a previously unknown gland closely situated to the nictitans gland. He originally called it 'Glandular nova lachrymalis'. The nictitans gland, was then known as the 'Glandula lachrymalis' The lacrimal gland itself was then known as the 'Glandula innominata' Throughout the 18th century any glandular tissue in this area was referred to as the Harderian gland, and the distinction between this gland and the nictitans gland was lost. It wasn't until the late 19th century that the distinctions between the two glands were again appreciated. The Harderian gland has many functions and some of these are not yet fully understood in many animals. It is regarded as an exocrine gland, which means it secretes its products via a duct. Typical exocrine glands include sweat glands, salivary glands, and many glands of the digestive system. In the case of the Harderian gland the secretions that are produced (which are mainly lipids or fats) coat the eye and the nictitating membrane and help keep to keep them lubricated. The fluid produced is then drained into the nose by the way of the nasolacrimal duct. In the gerbil the Harderian gland itself is almost black in colouration due to the presence of melanocytes, which are cells that produce the pigment melanin. 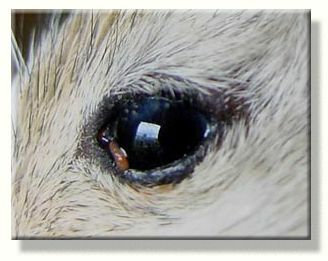 It is known that in gerbils and other rodent species that the gland contains photoreceptors, which indicates that the gland itself maybe sensitive to light. Unlike the eye it cannot see images but can sense light and may help regulate the pineal gland. In research on the Harderian gland in gerbils it has been shown that the fluids produced have several functions. The fluid itself contains an attractant pheromone, which the gerbil mixes with its own saliva and spreads over its face and coat during grooming. The fluid is known to fluoresce, and gerbils can taste and also smell this pheromone present in the fluids produced by the Harderian gland. In experiments gerbils actively sought out and investigated extracts of this chemical even when it was on its own and placed on various objects. In addition to the fluid being used as a form of chemo - signalling, the complex mix of lipids and pigments present in the fluid also help the gerbil to regulate its body temperature. These are spread over the coat during self-grooming. Cold temperatures can often trigger a self-grooming session, and it is known that the lipids present in the fluid help to insulate the gerbil against cold and wetness. The lipids and pigments also darken the coat and thus increase radiant absorption, so body temperatures are maintained at a higher level than they normally are. In hot temperatures this type of lipid grooming is curtailed and replaced with saliva grooming to aid in the cooling process. Sand bathing is increased too in hot temperatures, which also helps to remove excess Harderian fluid off their coats. These actions help the gerbil to optimise its body temperature by varying the frequency of grooming and sand bathing, and by altering the amounts of Harderian fluids and saliva that is released. 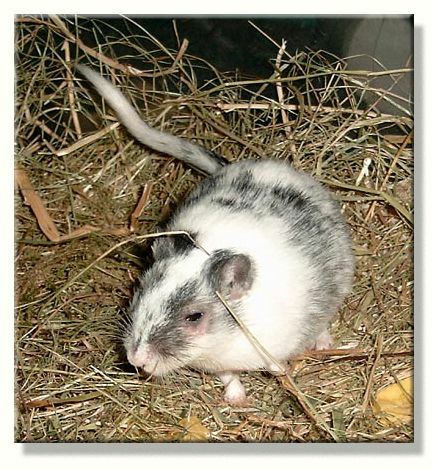 Self- grooming is a critical behaviour for gerbils to help maintain thermal needs, and other animals that live in arid environments use similar mechanisms to achieve this. While it's known that normal amounts of porphyrins are necessary for a gerbil's well being excessive amounts may indicate underlying health problems and can lead to infections. Porphyrin filled tears can overflow the eye and dry on and around the eyelids and nose and can cause a condition known as chromodacryorrhea. This condition can be due to stress, an underlying illness or even a poor or inadequate diet. Stress can happen in many ways and can include anything from the loss of a cage mate, an incompatible mate, an overly long split cage introduction, lack of water, or increased anxiety through overcrowding. Often nasal dermatitis can be a result of these conditions and it can easily spread to other areas. If left unchecked or the cause of the condition isn't removed, alopecia, erythema (a skin rash or reddening of the skin) and severe scabbing can be the result. Even the forepaws can be affected to an extent. Often the problem can be exacerbated by bacterial infections and has been related to Staphylococcus saprophyticus, S.xylosis and S.aureus, and also by the gerbil rubbing and scratching the affected areas. It has been noted that Elizabethan collars that prevent grooming actually worsen the condition, and that animals that had undergone Harderian gland adenectomy did not develop this disease, however vets rarely undertake an operation like this. The condition quickly improves if the causes of the initial stress has been positively identified, also a change to a sand or clay substrate helps to alleviate this condition. The affected areas should be cleaned and bathed whenever necessary and ophthalmic ointment from a vet can be very useful to treat the condition. Thanks to Eli Wolfmayr & Nikki Yapp for the photographs.